It could be true of all writers; it’s certainly true of me that places I’ve been to in my life have inspired my writing. From rowdy schools I’ve attended to stately homes nestled in the rolling English countryside, places play an important role in my work. Even if I take artistic licence and create a place for a story in my imagination, places are vital to the unfolding of the narrative in my stories. So which places in particular have inspired my writing? Well to create a fictional village in my current WIP I drew inspiration from a small market town called Marlborough in south western England – for those of you outside the UK! It’s a very pretty town, not too built up, with plenty of pubs to eat and drink in! My husband and I met up with my parents there one year as we live quite far apart and Marlborough is sort of half way between our homes, so it’s easier for us to meet there instead of going all the way to each other’s houses. I think it was New Year’s Day and we had lunch in a pub where the landlord was tired because they’d been on the go all night (New Year’s Eve! ).Technically the town is bigger than the village in my story, but I felt the atmosphere in Marlborough was right for the place I was creating. Then of course are the dreaded schools! If you’ve read some of my previous blog entries for Thursday’s Children, you’ll have seen that school days play a big part in my writing and that I didn’t enjoy school much! But it’s great or at least cathartic to write about a fictional school as I remember my own school days. I bring into my writing details about the school buildings as well as creating characters resembling nasty pupils I’ve known! A stately home comes into my WIP as well. I’ve made it a spa in that particular story. I’ve visited a fair few big old houses in my time and they can be a real inspiration too. They’re invaribly large and history oozes out of them. Sometimes you almost feel as though you’re stepping back in time. In the ghost story I was writing years ago, the stately home in that story was definitely inspired by many similar buildings I’ve been to – though without the ghost of course! Many places inspire my writing and I’m sure there’ll be places I’ve not yet been to which will inspire me just as much, if not more. I haven’t found them yet, but I will! Are there particular places you’ve been to which inpsire your writing? 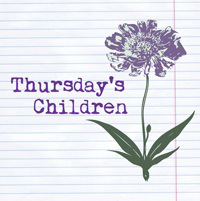 If you would like to take part in Thursday’s Children, simply write about what inspires your writing and then enter your details on this link. Thanks again to Rhiann Wynn-Nolet and Kristina Perez for hosting. Places definitely inspire me, the more Gothic the better. That might mean a foggy, deserted beach or a lighthouse in a hurricane, or something uber-Gothic like a cemetery. Right now I’m doing some research on grand old houses of the Hudson River Valley (I went to that area, but it was AGES ago). Places are such an inspiration. I live in a beautiful rural area and there are so many wonderful features around me. It can be both pretty and life affirming or sometimes desolate and chilling. Quite perfect for a number of stories. Glad you enjoyed it! I would love to travel more really and get to see even more inspiring places. It’s nice that your home city is such an inspiration for you. 🙂 My home city of Bristol (UK) inspires me too. It was setting for a novel of mine I wrote a while back. Different places inspire in different ways I think. Ah thank you Kate. Yes castles are a great inspiration, they’re so atmospheric aren’t they. I’m incredibly inspired by places – of course – I tend to tweak the real ones and make them slightly less recognizable. Munising, one of my favorite coastal towns on the shore of Lake Superior is the setting for my last book. It’s a fun challenge I think to create your own places in your writing. There’s so much you can create from imagination. I think fantasy authors probably have the best time of it – anything goes! Yes it would be nice to meet but only if not too much trouble to you. 🙂 I have a writer friend who also lives in Bristol and takes part in Thursday’s Children – Kate Frost – so you never know you could meet her too! Oh and in answer to your question email is better for me. When I was 10, I went to Russia with my mom and a group from her church. We lived in an orphanage for two weeks and put on a summer camp for the kids. I still remember that place. Old stone and Soviet concrete, unpaved roads, unwashed and unwanted children. It was intense. Now, I write stories about tough people in tough places. Coincidence? That must have been a real eye opener. It’s experiences like that which enrich our writing I think. Oops, I am not awake today. That was supposed to stay in my thread and didn’t. Places definitely inspire me — but often not the real kind! I love being taken to new worlds, via movies, books, or even non-fiction stories and articles. That kind of stuff really helps me build an image of potential settings in my mind, which inspires my writing. The places you describe sound so inspiring. I love old homes and buildings. I’d love to find some to visit.